Did you know that it's extremely easy to run Infinispan in OpenShift? Infinispan 9.0.0.Alpha4 adds out of the box support for OpenShift (and Kubernetes) discovery! We'd like to build an Infinispan cluster on top of OpenShift and expose a Service for it (you may think about Services as Load Balancers). A Service can be exposed to the outside world using Routes. Finally, we will use REST interface to PUT and GET some data from the cluster. Of course before playing with Infinispan, you will need an OpenShift cluster. There are number of options you can investigate. 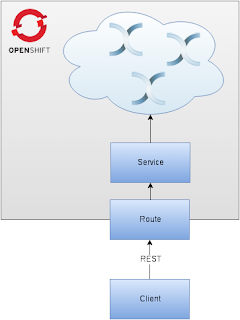 I will use the simplest path - OpenShift local cluster. The first step is to download OpenShift Client Tools for your platform. You can find them on OpenShift releases Github page. Once you download and extract the 'oc' binary, make it accessible in your $PATH. I usually copy such things into my '/usr/bin' directory (I'm using Fedora F23). Note that you have been automatically logged in as 'developer' and your project has been automatically set to 'myproject'. (lines 58-60) - Modified Infinispan startup parameters by adding image startup arguments. (lines 88-90) - JGroups Kubernetes Discovery protocol is instrumented by the Downward API to use current project's namespace.